I learned via osmosis from watching my parents entertain that an antipasto platter is really all you need with drinks before dinner. It’s certainly simple enough for the busy host to put together, and always popular with guests because all those salty foods taste wonderful with cocktails. But there are antipasto platters and there are antipasto platters. My parents always had the best stuff because every time my father went to Italy, he would wedge all sorts of cheeses and salamis in his suitcases to bring back home. Actually, he still does it! But beyond delicious cheeses and cured meats were always beautiful olives, marinated artichokes, homemade roasted peppers with garlic and herbs and some crusty bread to put it all on. I don’t eat most of that anymore, but I still reminisce about the delicious flavors. When I saw this amazing salad at Mozza, Nancy Silverton’s restaurant, it reminded me of my parents’ antipasto platters, but probably better for you since it’s disguised as a salad. I have been a Nancy Silverton fan since her days at Campanile and The La Brea Bakery. I think everything she creates is utterly delicious. It’s called the “Nancy’s Chopped Salad” and it’s almost famous in LA. 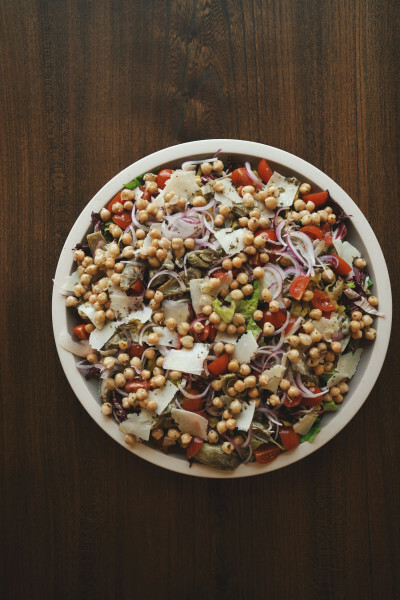 Chock full of chickpeas, provolone cheese, salami and tomatoes, and a zesty oregano dressing, it’s similar to, but way better than, a lot of house salads I have had at Italian restaurants in the US, including the one they had at the old La Scala restaurant in Beverly Hills. That said, I couldn’t help but tinker with this salad to make it vegetarian, and a little lighter. I taught my version of this salad in my classes this year, but encouraged everyone to adjust the ingredients to suit their tastes. I love, love, love bitter lettuces like radicchio, but when I am hoping to appeal to younger kids with this salad, I substitute red cabbage which is much milder, but just as crunchy and healthful. 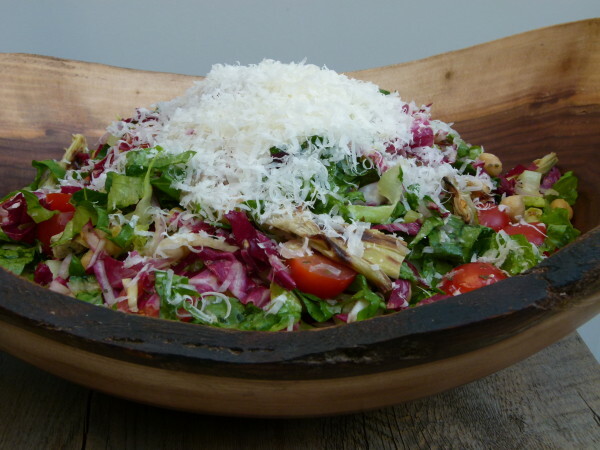 Sometimes I’m feeling cheesy and with a vegetable peeler I’ll shave lots of Pecorino or Parmesan into the salad (see top image), but if I’m not in the mood, I’ll just take my microplane and dust a bit on top (see image below.) My favorite part is the roasted artichoke hearts, which is my sub for the salami. Obviously they don’t taste the same. I haven’t completely gone off the deep end. But there is something really hearty and substantial about the artichokes, especially if they get a nice crispy edge to them. During the summer, it’s not unusual for me to make a hearty salad for dinner. I always have Mr. Picky take out what he wants before I dress it because he’s not open to vinaigrettes yet. He will eat plain chickpeas, cherry tomatoes, romaine lettuce and the occasional pickled pepper. And Mr. Picky’s dad, my husband, has really come around to the Meatless Monday schedule. He used to look at me with raised eyebrows when I made a dinner without animal protein, but lately he’s been much more open to a very veggie dinner or weekend lunch. They all come around, don’t they! Author: Pamela, adapted from the "Mozza Cookbook"
Preheat oven to 400 degrees. Line a baking sheet with unbleached parchment paper. 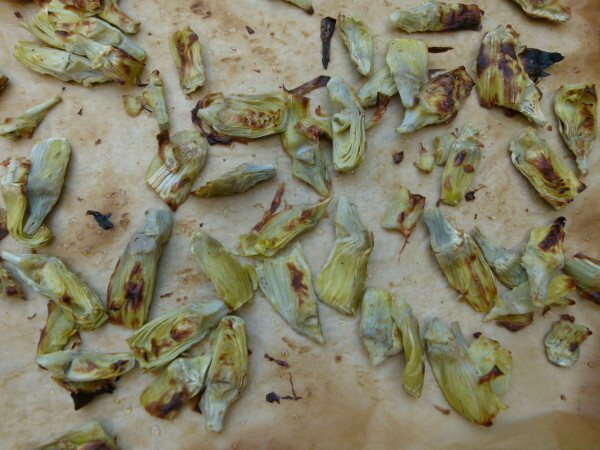 Place the artichoke pieces on the prepared baking sheet and toss with the tablespoon of oil. Sprinkle with salt and pepper. Roast for 20 minutes or until lightly golden brown around the edges. 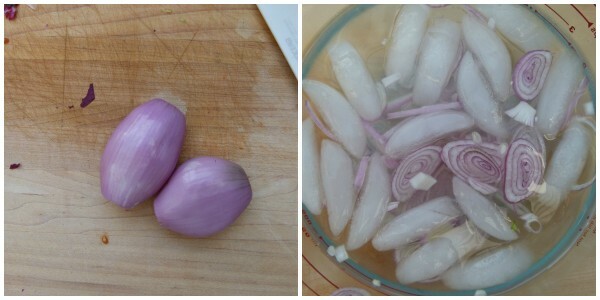 Optional: in a small bowl, soak the onion slices in ice water for 15-20 minutes. Drain and pat dry with paper towels. This will cut the harsh flavor of the raw onion. If you don’t mind raw onion, don’t bother soaking. Place the lettuces in a large serving bowl. Add the roasted artichokes, cherry tomatoes, chickpeas, cheese, pepperoncini, and onion. Prepare the dressing: in a medium bowl or in a screw-top jar, whisk together all the dressing ingredients. Drizzle enough dressing on salad to lightly coat. Toss and taste for seasoning. Serve immediately. Do not for a minute think you need to follow this recipe exactly. Just don't add so many extra ingredients that you don't have enough dressing. Cannelini beans are a great sub for chickpeas, you can add sundried tomatoes in the winter instead of fresh, add chunks of fresh mozzarella or pieces of fontina or Havarti cheese instead of Parmesan. The original recipe calls for provolone. 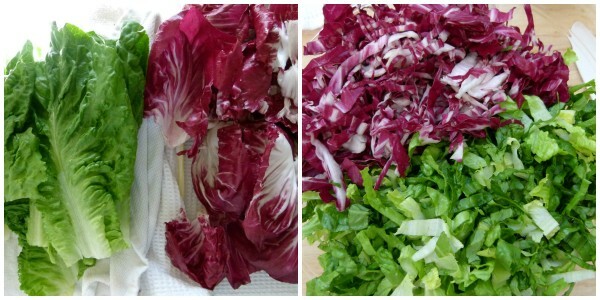 Radicchio looks so pretty, but arugula would taste great, too. I made this yesterday for my mother in law’s birthday and it was so good! It tasted just like antipasto salad. I didn’t miss the meat at all. I did use white beans because she doesn’t like garbanzo beans and added the fresh mozzarella. That dressing! I always double the dressing so I have leftovers for my salad this week. I will be making this again. Thank you as always. . Hope you had a nice 4th. I did red cabbage too to give it that extra crunch. Can I use artichokes packed in water? It’s hard to find the frozen artichokes. 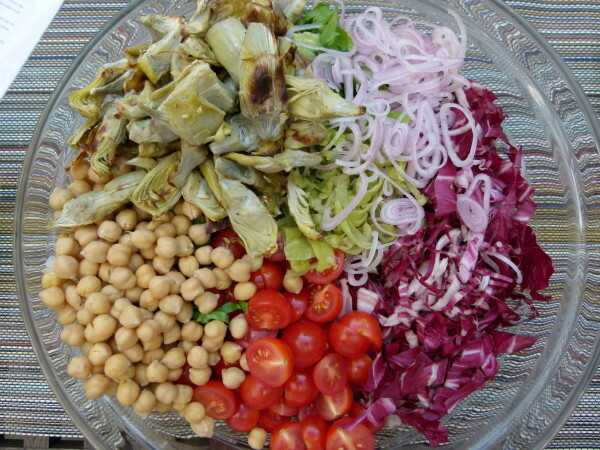 I love this salad and have made it many times. I recently wanted a quinoa salad and thought of this. I just replaced the lettuce with cooked quinoa, swapped the shallots for some capers and added black olives. It was fantastic!!! I bet that was fantastic! Thanks for sharing — love that idea! I’ve yet to see frozen artichokes, but I bet they are amazing. I live in Sydney, Australia so maybe they are available in the states but haven’t made it here yet. Looks delicious, I will be trying this one soon!